The Rock paintings of Astuvansalmi at Ristiina is part of the Tentative list of Finland in order to qualify for inclusion in the World Heritage List. These T List rock paintings are, in our view, well worth visiting, despite being somewhat off the main route in this part of SE Finland. It turns out that prehistoric rock paintings are something of a "Finnish speciality" and contribute to an understanding of the early population and even to the current cultures of Fennoscandia. These are around 1.5 hours by road NE of Verla mill on the route to Savonlinna but the return detour at Ristiina and the walk to/from the paintings will add around 2.5 hours to the direct journey to S.
In Ristiina the destination is signed both at the town’s entrance and exit along 4323. There are no more signs along a good road until the car park 19kms further on. The sign there gives no indication of how far the walk to the paintings is - for most people around 30-45 minutes each way I would guess plus “viewing time” of c30 minutes. The start of the path is marked by a small wooden pointer on which is marked an example of a painting of an Elk from the site – the dot/circle represents the animal’s heart (photo). The path rises and falls a bit and was a bit muddy in places (we faced intermittent rain!) but, despite it being August, we were not bothered by mosquitoes. There was a small number of mainly Finnish visitors (with some Russians) along the track on the Wednesday pm we visited. The car park only takes around 10 cars. If you have already been to Verla you will probably have seen something of the rock paintings there. They are inside the core area and are mentioned in the AB evaluation (the nomination File isn’t on the UNESCO Web site) but they don’t figure in the site’s OUV. In her review of Verla, Els was apparently unable to make them out. They are around 50metres away across a lake and maybe the light was better on our visit, but we could distinguish a couple of (European) Elk among the 8 (plus 3 human figures) which are supposed to be there. At Astuvansalmi, the figures, in this case a mixture of elk, humans, boats and hands, are only 3-4 metres above you (somewhat more above current water level) and are in surprisingly good condition, having been protected by an overhang (The Verla AB evaluation states that the red paint there has been “preserved by a thin laver of silica deposited on top of them” and this appears to have been a significant factor in the preservation of all the Finnish rock art visible today). Other excavations (including underwater) have recovered stone arrow heads and carved amber articles. They were only “discovered” for archaeology as recently 1968. The entire area has undergone significant changes in water level from various causes (land uplift, changes in water courses, “filling”/“emptying” of lakes etc) since the last Ice Age and Finnish rock paintings are usually associated with lake and river based water routes and the rock faces along them. The depiction of boats shows the peoples to have been proficient water travellers The height of the figures on the rock face indicates approximate water level at the various times of their creation (they are thought to have been painted from the water) and “dating” is estimated using “shore displacement chronology”! Those at Astuvansalmi are placed at being from c3000BC in the late “Stone Age” and the term “Sub Neolithic” is applied to them - a term “used in archaeological contexts to refer to peoples that, while being in contact with neolithic (farmer) groups, remain attached to their traditional hunter-gatherer practices, incorporating only some secondary neolithic elements (typically pottery)” (Wiki). I have been unable to access any information on how likely the site is to be nominated. The notice boards state that this is Finland’s largest rock painting site (out of c125 locations) at c17m x 8m in size, with approx 60 identifiable individual figures - though elsewhere I have read that a site around 170kms NW at Saraakallio is both bigger and has more figures. Some sites also seem to have been dated rather earlier. Surprisingly, given the relatively “nearby” petroglyph sites (each around 1100kms away according to Google!) at Tanum (Bronze Age) and Alta (Stone and Metal ages), there are only rock painting sites in Finland. We have often commented on this Web site about the number of Rock Art sites which have been inscribed and the number around the World still on T Lists. How will a decision eventually be made on when the domain is “fully” represented? Does each region, period and culture justify representation? Spain alone has over 700 Rock art sites in the “Mediterranean Basin” plus another 18 in the North and another 17 shared with Portugal in and around the Coa valley! It would appear that Finland could put together a multi-location collection of rock painting sites representing periods and a culture not currently represented on the inscribed list. All of its Stone Age examples relate to the same N European hunter-gatherer culture known as “Comb Ceramic” which spread west from the Urals and probably formed the basis of Finland/Estonia’s Finno-Uguric language background. The interpretation of the rock paintings by Finnish academics which I have read links them closely to Finnish mythology as later represented in the Kalevala national epic, the tales of which had survived until the 19th C in oral form, as well as to Saami Shamanism. Thus the female figure holding a bow which can be made out at Astuvansalmi as well as some of the figurines recovered from the site have been linked to “old gods” from the Kalevala and Saami traditions. How much of this relates to 19th/20th C Finnish “national myth making” (prevalent of course in many other European countries!) I don’t know, but one would have thought that a competent group of people could put together a story around it which was good enough to bolster justification for inscription? If you want to read more on the paintings and their interpretation I found this quite useful - https://helda.helsinki.fi/bitstream/handle/10138/19406/atoucho.pdf . It's hard to miss this place when you're driving around eastern Finland. There are roadsigns to this site from all the main roads and it's good thing because these rock paintings are in the middle of nowhere. Walk from the road to the paintings can feel long for those who are not fit and in summer the forest is full of mosquitos. But when you get to the site it's all worth of suffering. Paintings are really clear and there is lots of them. 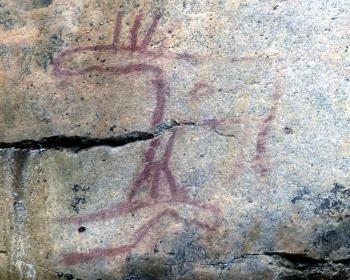 Usually Finnish rock painting sites include only one painting or the paintings are almost disappeared. Surroundings are beautiful with Lake Saimaa sparkling in summer sunshine. Information is available in English at the site. There is a dock for a boat if you are sailing around Saimaa. I think this would be good add to the World heritage list.It really represents eastern Nordic history.